Last time I wrote about social wasps, and how useful they are. There are though many other sorts of wasps which live more solitary lives, and are mainly insignificant black or brown insects. They do not sting us and are generally unnoticed. Some do come to our attention because of the effects they have on plants. One such is a gall wasp which feeds on the acorns of oak trees. This little creature is having a very good year. If there are any oak trees in your neighbourhood, or your favourite woodland or park, you may have noticed that their acorns don’t look right. It is likely that nearly all of them will be obscured by knobbly red and green, sometimes sticky, growths. These are knopper galls and inside each of them is a tiny parasitic wasp. Affected acorns tend to fall early from the tree and will be scattered on the ground. This wasp, which first appeared here in the middle of the 20 Century, is one of a closely related group which all cause galls to grow on oaks. (A gall provides the insect with food and shelter, and is the oak’s reaction to its presence.) These wasps have complex life-cycles involving a second generation which causes minute galls on Turkey oaks. Turkey oaks are not native, before their introduction about three hundred years ago therefore the gall wasps could not have survived here. The ones in the knopper galls are long-lived – they may well not emerge as adults for a few years. Insignificant as the insects are their galls used to be commercially important. They concentrate tannin in the gall tissues and, as the name suggests, this was vital to the tanning industry. 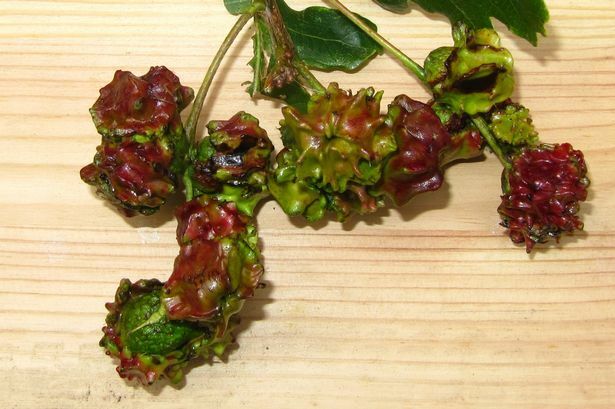 For this reason one gall wasp, which causes the round, brown marble galls on oak, was deliberately introduced to England in the 19 Century. In earlier times the East India Company’s first charter allowed it to import galls to England. We do have native galls of course. In the past they were ground up and used to make ink. Many large estates had their own unique recipes for this, making it is possible to authenticate historic documents by analysing their ink. Until quite recently the high quality inks used for some banknotes were derived from the same sources. Food for thought maybe as you crunch the galls underfoot on your autumn walks.